There are many senior Facility options available, it’s easy to feel confused and overwhelmed by the vast number of care types and styles of senior living communities. It’s important to learn the terminology and the differences between senior care solutions that are out there so you can make the right choice for your family. Senior independent living Facilities related to seniors who are very independent with few medical problems. Residents live in fully equipped private apartments. Independent Living communities are senior housing communities designed for independent seniors that desire the conveniences of community living. These communities offer a senior lifestyle filled with recreational, educational and social opportunities. Assisted-living arrangements help people stay as independent as possible while offering necessary help. They provide personal care and support services or help with basic daily activities, such as bathing, dressing, and medication management. 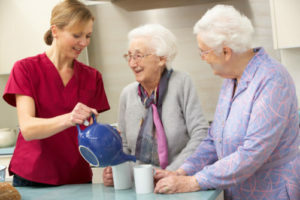 Most assisted-living residences provide an apartment-style living, though there are also “board-and-care homes” and “personal care-group homes,” which are single-family dwellings licensed at the state or local level to provide care. They offer meals, activities, housekeeping, transportation, and some level of security. Nursing homes provide around-the-clock skilled nursing care for the frail elderly who require a high level of medical care and assistance. These facilities provide skilled nursing care for older adults who require it. While the homes have doctors on staff, nursing assistants provide most of the help with basic, daily activities, and nurses direct medical monitoring and intervention when necessary. 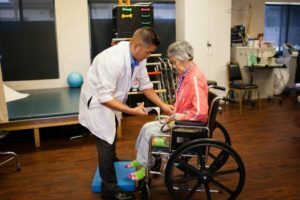 Their work is often supported by speech, occupational, and physical therapists, who work to keep residents as strong as possible. The nursing-home decision is one of the most difficult housing choices that families have to make. Quality can vary among these facilities. 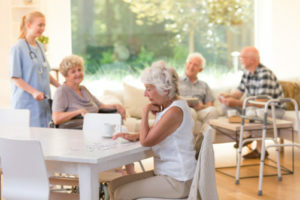 senior housing options for people with dementia or Alzheimer’s are available Alzheimer’s disease and other related memory disorders or dementia, there is a growing trend towards facilities that provide specialized care and housing tailored to the special needs of individuals with this disease. These facilities offer care that fosters residents’ individual skills and interests in an environment that helps to diminish confusion and agitation. Specialty services are provided in a secure environment, such as activity programs designed to include reality orientation classes and specially trained professional staff skilled in handling the behavior associated with memory impairments. Many facilities that specialize in Alzheimer’s or related dementia disorders have building design features that assist with the problems associated with this disease: color-coded hallways, visual cues, and secure wandering paths for additional security. Residential care homes are private homes that typically serve residents who live together and receive care from live-in caretakers. These homes offer assisted care services for seniors who want a more private, home-like community. Assistance with activities of daily living such as bathing and dressing are typically provided. Amenities and nursing services vary greatly between homes. Ask about their services when you tour. Respite Care is a short-term stay option for seniors currently receiving in-home care. It provides temporary relief from duties for caregivers, ranging from several hours to days. Taking care of an elderly person can be physically and emotionally exhausting. It’s important for caregivers to seek out occasional relief from their responsibilities. Whether it’s a few hours a week, or a few weeks a year for a vacation, respite care gives caregivers the ability to reduce stress, restore energy and maintain a balanced lifestyle. 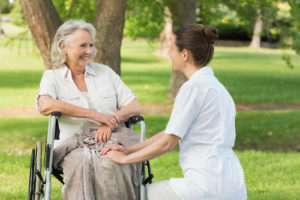 Generally, respite care refers to a short-term stay at a senior citizen community, giving seniors a comfortable and engaging living option for those who need daily assistance, while their main caregiver takes relief from all responsibilities. It can also refer to short-term in-home caregiving services too. Some caregivers may want to try respite care to help gradually ease their loved ones into living at a senior housing community. 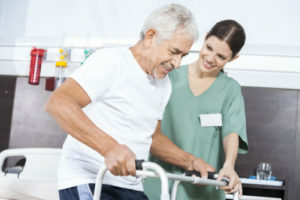 Home Care is a general term to describe services delivered at home to recovering, disabled or terminally ill persons in need of medical, nursing, social or therapeutic treatment. 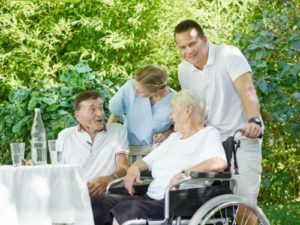 With most seniors wishing to live at home for as long as possible, home care provides a range of services to the elderly as well those who are recovering, disabled or terminally ill, allowing for a more comfortable experience. Home care services give seniors a sense of independence, while still assisting them with an assortment of basic needs and activities.